Save Marinwood-Lucas Valley - our community, our future: Coming soon to Marin- Eastern Bloc Apartment Buildings? Coming soon to Marin- Eastern Bloc Apartment Buildings? City Council members considering changes to development rules heard emotional testimony from homeowners upset about how their neighborhoods are changing. 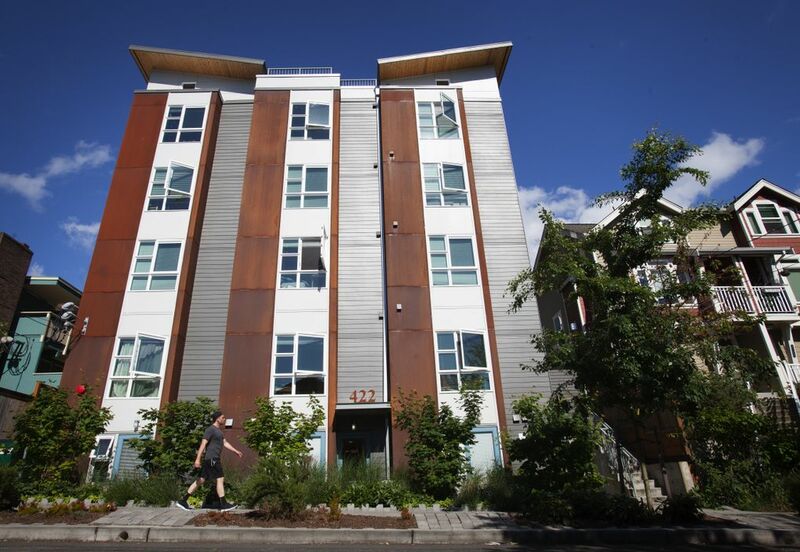 Seattle is in danger of becoming the Soviet Warsaw or East Berlin of the Pacific Northwest, said angry homeowners who showed up at City Hall last week to holler about minor changes to the rules for new homes in low-rise zones. The proposed changes in a measure under consideration by the City Council this summer are fairly arcane: They involve breezeways, clerestories, partially buried floors and rounding thresholds for density calculations. But more than one person who slammed the legislation, claiming it wouldn’t do enough to halt out-of-character development, said the council will determine whether Seattle remains a garden city or acquires a bland, Stalinist cityscape. “Stop this city from looking like an Eastern Bloc city,” said Imogen Love, of Ballard. After more than an hour of testimony from dozens of people on the changes during Tuesday’s land-use committee public hearing, even Councilmember Tom Rasmussen succumbed to hyperbole. Not every argument was so extreme, but most people who testified for tighter regulations last Tuesday described the development issue in personal terms. Roger Valdez, a lobbyist with Smart Growth Seattle who argues for more development, warned Rasmussen and the council to set aside “the raw emotion you’re going to hear today.” But Ballard homeowner Pennie Clark turned his rhetoric around. The bill, which could head to the full council as early as June 16, would adjust zoning changes enacted in 2010. Since then, many residents have complained about developers taking advantage of loopholes to construct buildings with more height, more bulk and more units than planners thought the 2010 changes would allow. In 2013, then-Councilmember Sally Clark asked the Department of Planning and Development (DPD) to review the rules, and in May 2014 the DPD released a plan. Regulation advocates who testified Tuesday said they were happy with the DPD plan, which withstood a subsequent legal challenge from Smart Growth Seattle. Later in the process, Councilmember Mike O’Brien, who chairs the council’s land-use committee, sat down with members of Mayor Ed Murray’s Housing Affordability Livability Committee, including architects. The result is a modified bill, which Murray supports. The bill does some important things that proponents of tighter regulations have asked for. It would require upper-level setbacks where new buildings in low-rise zones meet the street, a change designed to make the buildings look and feel not quite so tall. The bill also would reduce the number of town houses allowed on small lots of less than 3,000 square feet, and it would stop developers from using clerestories — oversized skylights — to build penthouses not otherwise permitted. In low-rise zones, usually found between commercial and single-family areas, apartment buildings, town houses, row houses and single-family homes are allowed. From September 2011 to September 2013, 35 percent of building-permit applications in low-rise zones involved town-house construction, according to the DPD. There are some things the bill wouldn’t do. Principally, it wouldn’t scrap a workaround allowing developers to build higher on projects with partially buried lower floors. It also wouldn’t establish side setbacks for row houses not adjacent to other row houses. Eliminating the bonus for partially buried floors, according to O’Brien, would reduce the number of units that developers could build and would discourage them from constructing main floors raised slightly above the street, outcomes that he wants to avoid. The homeowner crowd that packed City Hall has a champion there in Rasmussen, who earlier this year dropped his bid for re-election. He promised Tuesday to advance the cause of neighborhood preservation, one way or another. Councilmembers Kshama Sawant and Nick Licata, who dropped in on the committee for the hearing, also expressed support, which suggests O’Brien may have trouble keeping the bill in its current form as it makes its way through the council. Editors Note: The Pied Pipers of Smart Growth tell us that "single family homes are the past, the millennial generation love high density apartment blocks". Yea right. There are already plans for these style buildings all over Marin. We must Save Marin again!